Snrky: Not surprisingly, that's the same outcome as a relapsed workaphobic. Not surprisingly, that's the same outcome as a relapsed workaphobic. I hate it when people say this. I don't have much more to say than I hate it. I hate it so much I generally have to restrain myself from just walking away. It makes me angry. Perhaps because it implies the individual feels they had no self-control over their situation and that work is the equivalent of alcoholic or meth and that it excuses certain behaviors that impacted other aspects of their life. Snrky: I like to tell people I'm a recovering workaholic. 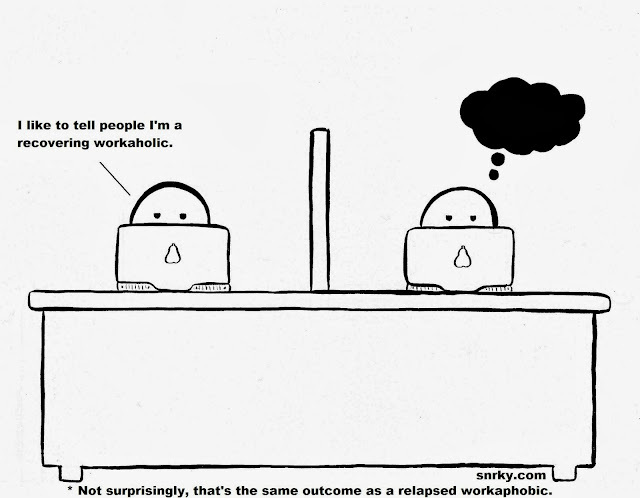 Title: Not surprisingly, that's the same outcome as a relapsed workaphobic.